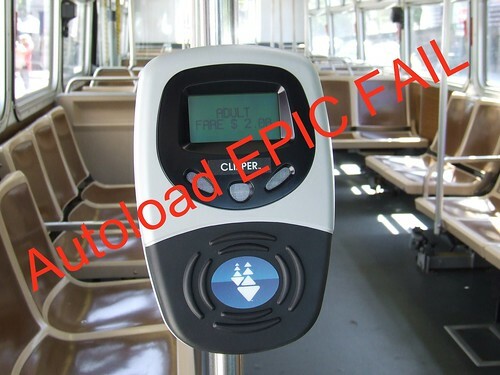 I've warned people before, Clipper card's Autoload program has problems. But in light of the problems came the worst epic fail of all... being charged on your credit card for a reload of e-cash two years ago. That's right. KPIX reported yesterday that the folks at Clipper and MTC noticed a glitch in the system back from 2010. Clipper card passengers who rode affected vehicles had their funds automatically reloaded for reaching a certain threshold, but the information from the consoles was not transmitted back to Clipper for credit card processing. Basically, the passengers went off scott free with some free e-cash that was never charged to their linked credit card. But now that the MTC found out, they are sending notices out to nearly 8,000 Clipper card users that they will get charged for the amount they owe. I can understand the MTC's point of view of getting back $230,000+ lost dollars, but it took two years? Let's remember that Clipper card history reports can only be retrieved by customers as far back as 60 days. The MTC should make an effort to show each customer being billed for the two year old charge to get some kind of documentation back from two years ago. Now you wonder why I warn people to not use Autoload. You'll get screwed no matter how long ago it was. Stick to loading e-cash and passes by going to vendors and self-service machines. You'll always know that when you load funds, it's both instantly available to use and you get a receipt of your transaction as proof. Once again the infamous Autoload causes another major fail for Clipper! I am not sure they can go back and charge for 2010. There might be a statute of limitation that has passed (either federal or state) that someone may use to block or at least challenge it. Also some people may have closed their credit cards and they cannot charge those cards now. It is a can of worms I can see heading to a courthouse. I had a problem not to long ago with my DSL provider. I signed up for a yearly service but the charge never appeared. They swore it had gone through (had the transaction number etc)but my credit card never received it. It was a phantom charge and eventually it got sorted out a few months later (I paid a little less because some months had gone by). How Clipper missed those payments is shocking. Hopefully some news people will start digging. Either no one was watching or perhaps something else was going on. Yep auto-load is the bane of my life (at least the last 2 months). I would love to get away from auto-load but as you posted previously, you must have auto-load in order to use the high-value BART tix. This morning I confirmed again with a Clipper customer service rep that you cannot manually load high-value BART tix onto Clipper. He said the policy comes from BART. My problem is that I cannot track my value and usage easily on my cell phone. The Clipper site is not mobile friendly. I run into trouble when my usage exceeds the value on the card. I ride BART only 1x or 2x a week and often lose track of the balance. It'd be great if Clipper could improve their site for mobile users. Then we could check on activity (not just the current balance - which is often incorrect for auto-load customers). Or if the BART gates posted your balance instead of "OKAY", that'd be even better. You can find your commissioner's email address at Metropolitan Transit Commission Commissioner at the MTC website. I'm writing an email right now to the two Commissioners for my county and to the Chair of the Commission. I also sent a letter to the editor to the San Francisco Chronicle. Those can be submitted on their submissions page. actually like using Clipper's autoload, and had no problems with it. communicates with my employer, who communicates with me. and Caltrain, as I travel from Oakland to San Francisco or Palo Alto. I cannot predict how much money I will use on each transit agency. the old HVDs. No autoload here. 8-tickets which expire in 60 days after the date of purchase. October 1, 2 passes are loaded, with an expiration date of October 31.
danger of early expiration of the tickets. choose BART HVDs far in advance of the actual usage.